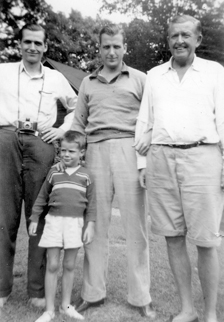 My father looked smaller than life when they opened the drawer at the police morgue on New York’s lower east side. But there was no doubt he was the man we’d been seeking since he'd disappeared a few days earlier. “We found an unidentified man in an alley off Madison Avenue,” the officer said when we called. “Somebody probably stole his wallet as soon as he hit the sidewalk.” My father was dead at 51, a casualty of the manic depression he had fought for years. The New York Times, citing its suicide policy, declined to print his obituary. He lived in a time when mental illness was an embarrassment for families and a weakness for men. For Dad it was a crushing blow. He had left Harvard early to join the marines, and flew dive-bombers in the Pacific. He came home from the war to a different world, a wife, two small children, no money and bipolar disorder. He prided himself on his toughness and never discussed his demons. Each year, one in four adults experiences mental illness, according to Bring Change 2 Mind, which has just released a series of public service announcements aimed at men, who still have a hard time discussing such things. Produced in partnership with NFL All-Pro Brandon Marshall’s Project 375, the PSAs feature accomplished men talking about the stigma of mental illness. My daughter Annie worked lovingly on those PSAs, which might have saved the life of the grandfather she never got to meet.